UC ANR growers identify new ways to improve productivity and tap economically viable channels for domestic and international markets. Extended bearing for blackberry fruit: UC ANR devised new management practices to extend the growing season for blackberries. In field trials, researchers were studying newer primocane-fruiting blackberry cultivars that bear fruit in the first year rather than the second year, as is common for standard varieties. The researchers discovered that a crop management regimen that begins with a mow-down in January, early pruning, and “tipping” to delay production results in extension of the growing season through late November or early December, thereby increasing productivity. 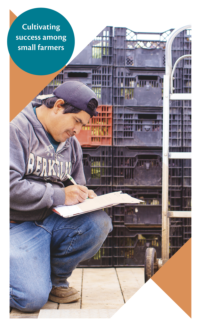 Nurturing farmers as well as farms: UC ANR helps growers manage not only their crops, but also their business practices. The UC ANR Cooperative Extension Farmer Individual Development Account program helps beginning farmers gain a practical understanding of agricultural finance, farm operation and commodity marketing. The program helps participating farmers develop a learning network and write sound business plans sufficient to grow their fledgling agricultural enterprises.